Okay, we are getting ready for our first trade show in years. We will be exhibiting at the Small Business Expo this Thursday at the Hynes Convention Center in Boston. Now is the test of our ability to actually pull together everything needed for a great trade show in just days. Why just days you ask? Well, we were called by the show producer just 2 weeks ago. I would have normally said no to them being so close to the show date, but they offered us a great rate on a booth and it appears to be a good show with lots of local small businesses. Our favorite type of customer! And even better, we have the first booth at the entrance! Pop Up 10′ Booth with full graphics which we will create, print in full color and mount to styrene panels which can be Velcro’d on the fabric panels. We already have a booth, so this will definately save us some time. I just need to update our display with our new logo and some exiting photos! A wrap for our booth carry case. The carry case will be converted to a podium where we can mount our monitor with a video of our work. Table Cover and table runner. We have a table cover, but need to print up a new table runner which I will print on our 54″ wide banner material. This will get our logo right up to the isle. What else do you need at a tradeshow? Brochures…okay, I goofed here. Being so busy, I haven’t had time to order anything. Fortunately we have a high-end laser printer and a good relationship with our local wholesale printer. I will print the full color brochures and have them folded by my wholesaler. We do this for our customers all the time! High end look in a hurry. Retractable banner display. Just a little more room to talk about our company and the many products we carry. And a chance to show off another product. Luckily I already have a banner designed that we were going to add to the showroom. So, just print and mount and that is good to go! Pens – luckily just ordered some really cool pens with our name on them. They even have an LED light on them! Classy. Magnetic Business Cards – A great giveaway. Customers can stick them on the filing cabinets, refrigerators, back doors! Hopefully keeping us top of mind when they have a sign project. These are easy for us. We can quickly create magnets of any size with full color graphics. Business Cards – Again, lucky for us we just reordered for our sales team so we are stocked and ready to go. Even if we hadn’t, we can get ourselves and our customers top quality full color business cards in just days. A great giveaway — still need to give this some thought, but electronics are nice so it will be something along those lines. I’ll also make a nice PVC Easel back sign for the top of our table to let people know about the Prize! Candy — gotta have candy. In my experience doing tradeshows, nothing starts a conversation like a free piece of candy. Lights – need to check our booth lights and make sure we don’t need to order new halogen bulbs – another product we can help our customers with. Literature Holder – Fortunately we have a nice pop-up acrylic one already. Again a product we can help our customers with. We’ll have to pull the team together. Dan will work on our video – he has a Certificate in TV Media from Nashoba Tech. Nick will print and mount our full color graphics. Andre will help me with booth setup and lugging all this stuff! Rich and I will be there to greet potential clients, talk up our company and products and hopefully make some great new contacts. Wow! I’m getting excited just writing about this. Two days out of the office, but never far away from my current contacts thanks to a laptop, iPhone, and cloud based sales software. Let the count down begin….3 days to go. Check back next week for pictures from the show. I look forward to seeing you all there! 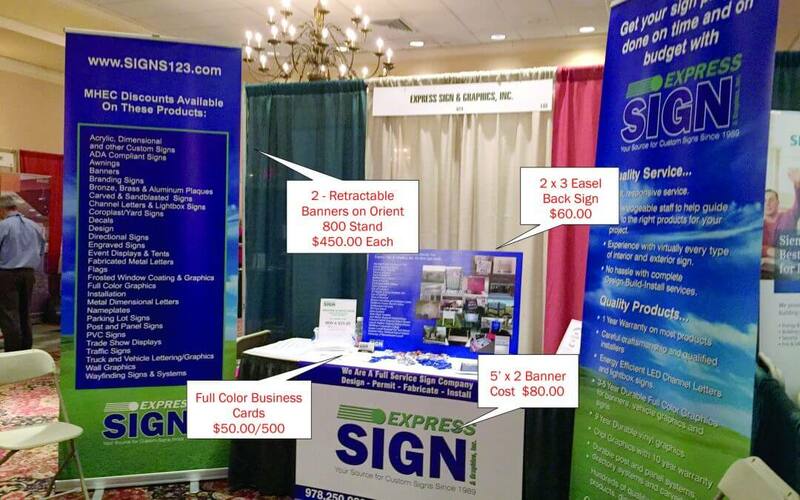 Better yet, call us at 1.877.SIGN123, or 978.250.9890 if you are looking for a great tradeshow booth, sign, banners and more!